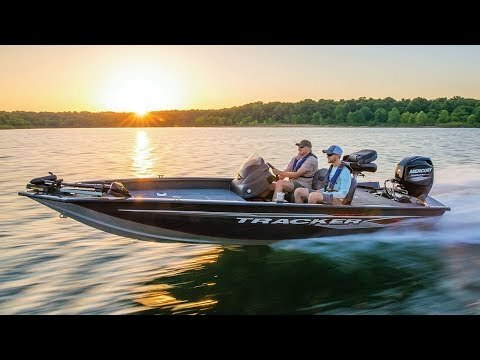 The TRACKER® Pro Team™ 175 TF is a multi-species fishing machine, with a lower front deck for close-to-the-action fishing. The deck layout is completely redesigned for 2019, with extra-large port and starboard rod boxes, a center tackle organizer and 3-across fishing seat bases. It also sports bow and aft livewells and our exclusive VERSATRACK® accessory-mounting channel in the gunnels. This all-around awesome fishing boat also features our beautiful Diamond Coat™ finish for long-lasting good looks and our exclusive Revolution™ variable deadrise hull with Smooth Ride Guarantee™. And it's backed by the TRACKER Promise—the best factory warranty in aluminum boats. Max. person weight: 560 lbs. Max. person, motor & gear weight: 1090 lbs. Average dry weight: 970 lbs. Average package weight: 2153 lbs.